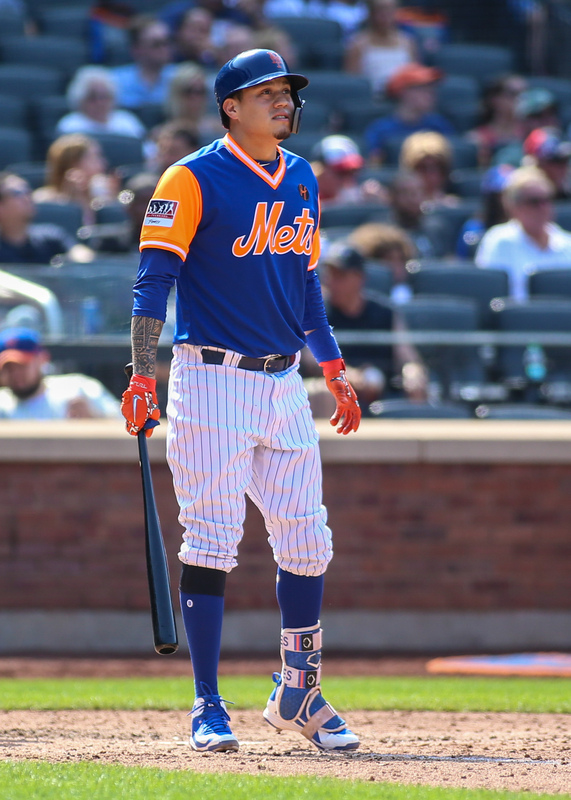 The Mets announced to reporters yesterday that they’ve shut down infielder Wilmer Flores for the remainder of the season after he was diagnosed with early onset arthritis in both knees (links via Newsday’s Anthony Rieber and MLB.com’s Anthony DiComo). It’s a curious diagnosis for a player who has yet to celebrate his 28th birthday, though Flores suggested that he doesn’t believe the issue will have a significant impact on his immediate future. For the time being, he received an injection in each knee with the hope that it’ll curtail the symptoms he’s been feeling. Asked about how the dual knee issues could impact Flores’ future with the team, manager Mickey Callaway was noncommittal. “I think that really depends on what the rest of our team looks like,” said Callaway. “He can definitely obviously fill in, and start, and swing the bat well and play good enough defense. … We’ll just have to see what the makeup of our team looks like next year.” Flores is arbitration-eligible for the final time this winter and hit .267/.319/.417 in 429 plate appearances. Dominic Smith’s future with the Mets is up in the air after a lost season, writes Mike Puma of the New York Post. The former first-rounder was recently viewed as the organization’s first baseman of the future, but that distinction could very belong to rising slugger Peter Alonso, who had a huge season between Double-A and Triple-A. The Mets have tried Smith in left field, though with Michael Conforto, Jay Bruce, Brandon Nimmo, Yoenis Cespedes (once he recovers from surgery on both heels) and others in the mix, his chances there could be slim as well. Smith chats with Puma about some of his 2018 struggles and his own cognizance of the crowded path between him and regular at-bats with the Mets, expressing confidence in his abilities and acknowledging that all he can do is force the team’s hand with a big showing next spring (if he’s not traded this offseason). The Mets formally shut Zack Wheeler down for the remainder of the season after a 101-inning increase in his workload from the 2017 season, Puma writes ina a separate column. The 28-year-old enjoyed an enormous rebound season after missing 2015-16 due to injury and pitching on a limited workload last season, as he rode a sensational second half to a 3.31 ERA with 8.8 K/9, 2.7 BB/9, 0.69 HR/9 and a 44.2 percent ground-ball rate on the season overall. Wheeler tossed a total of 182 1/3 innings, and it seems likely that he’ll pitch without any sort of innings limitation next season. Both manager Mickey Callaway and pitching coach Dave Eiland spoke with Puma about the strides Wheeler made in 2018, with Eiland in particular talking about how the dugout staff lobbied against trading the right-hander with the belief that the 2019 season could have a championship-caliber rotation. That’s been the hope in Queens for years, of course, but next year’s top four of Jacob deGrom, Noah Syndergaard, Wheeler and Steven Matz nonetheless looks quite promising if the quartet can finally stay healthy. Mets left-hander Jerry Blevins has cleared revocable trade waivers and is eligible to be dealt to any team, reports Ken Rosenthal of The Athletic (via Twitter). It’s unclear whether Blevins only recently passed through waivers unclaimed or it happened earlier this month, but any interested parties would need to acquire Blevins before Sept. 1 (Saturday) in order for him to be eligible for the postseason. The veteran lefty joins a growing list of players reported to have cleared revocable waivers. Blevins, 34, has pitched to a 3.86 ERA with 8.7 K/9, 4.1 BB/9, 1.01 HR/9 and a career-low 21.9 percent ground-ball rate through 35 innings. He’s had a strangely ineffective season against left-handed opponents, however, as same-handed batters have clobbered Blevins to the tune of a .297/.384/.508 batting line. That’s a significant departure from the norm for the veteran Blevins, who has held lefty batters to a putrid .212/.273/.319 slash (even including this year’s struggles). A free agent at season’s end, Blevins is playing the 2018 season on a $7MM base salary. He’s still owed about $1.23MM of that sum over the final few weeks of the season — a steep sum for a handful of appearances for a specialist bullpen piece. However, now that Blevins has gone unclaimed, the Mets are also free to include some cash in a potential deal in order to help facilitate a trade. 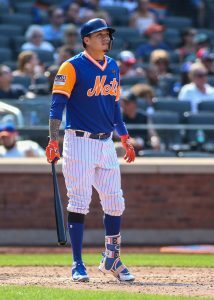 Rosenthal also suggests that infielder Wilmer Flores, whom Joel Sherman of the New York Post reported to have cleared waivers last week, is another potential trade piece over the next 36 hours. Flores is controlled through next season, so there’s no real urgency to move him as there would be with Blevins, but he’s a solid bat capable of fielding multiple infield positions, making him a potential fit for contenders on the hunt for a right-handed hitter. Seven-time All-Star David Wright has no quit in him. The 35-year-old has been rehabbing with the St. Lucie Mets since August 12th, and Marc Carig of The Athletic details his grueling push for a return to the majors against all odds. After undergoing three different surgeries in the past 26 months, Wright’s day involves painstaking attention to detail in his pre-game routine, and his overall rehabbing process has included broader-scale challenges up to and including completely relearning how to play catch. The Mets’ captain, however, has chosen to embark on this arduous journey back to the majors in part because (as Carig says) “even in the face of long odds, the fear of regret is a powerful motivator.” In Wright’s own words, “I guess it’s stubbornness on my part, wanting to give this another try and do this on my terms.” Carig’s piece is a length read that does an excellent job of providing insight into Wright’s struggles and perseverance. The Mets are making a mistake by not giving Dominic Smith an extended audition, David Lennon of Newsday writes, suggesting that the club appears to be entering the “evaluation period of this lost season, to see who should stick in 2019 and beyond.” If that’s true, Lennon writes, then the club ought to be giving Smith more playing time to see if he can develop into an everyday first baseman. The “jerking around of Smith” in an effort to give Wilmer Flores reps at first and make him more versatile doesn’t compute with Lennon. After all, the kid isn’t too far removed from being the 11th-overall pick in the 2013 draft, and it’s far too early to consider him a failed prospect. Since Lennon wrote his piece, the Mets have gone so far as to option Smith to Triple-A in favor of giving veteran Jay Bruce reps first. The newest member of the Mets organization is Dominican shortstop Willian Lugo, whom the club recently signed for $475K (h/t Jesse Sanchez of MLB.com). Notably, the club was able to bring on board in part due to the international bonus pool money they acquired as part of the trade that sent Jeurys Familia to the Athletics. Lugo did not rank among Baseball America’s list of the top 50 international prospects of the 2018-2019 signing period.